In honor of National Poetry Month, here is an excerpt from Kwame Alexander’s popular book The Write Thing, which showcases how to use poetry in Writing Workshop to motivate and engage all students through the writing process. In the book, Kwame stresses the importance of sharing your published work. The goal of the student presenter is to bring the material to life, to allow the listener to connect with the feelings conveyed in the piece, and to honor the words on the page as if they meant something to us all (because, they should). In order to accomplish this, students should understand the different methods of presenting their poems. Reading from your paper, device, or book requires ample practice so that you can learn the best pacing for the poem—slow or fast—pronunciation, and rhythms of the poem. While it is not necessary to memorize every word, it’s always a good thing to learn enough of it so that you can look up every now and then and see/connect with your audience. Once you gain significant confidence, experiment with the delivery and vocal variety. For example, what happens if you stress this word rather than that word? Reciting your poem requires the same preparation as reading, only you must memorize your poem. If you don’t have the poem memorized, you’re more likely to make mistakes when reciting it, even if you have it written down. I still know most of the poems I wrote decades ago because I’ve read them so many times. The best way for students to memorize a poem is to read it out loud as many times as possible. Read your poem out loud. Recite as much of the poem as you can, from the beginning, without looking at it. Repeat these steps until you can recite the entire poem from memory. Performing a poem can mean incorporating dramatic presentation, integrating voice, vocal changes, possibly song, and sometimes call and response. 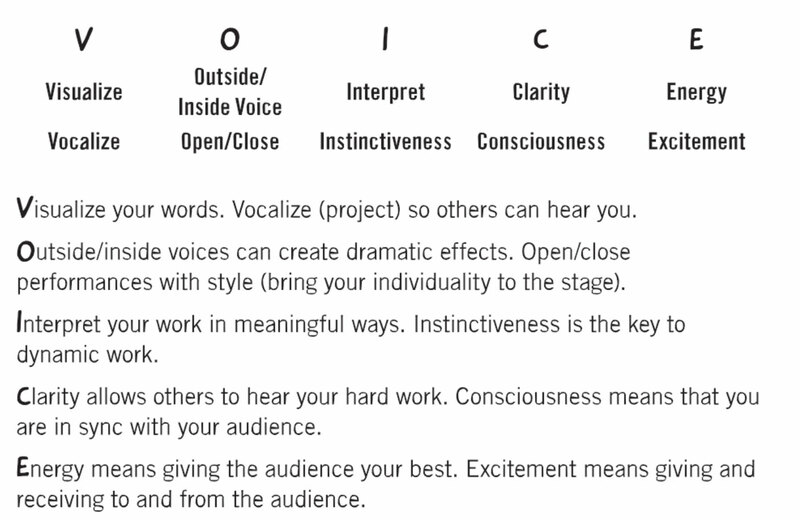 Use the acronym VOICE to help your students visualize an effective performance. Bringing all these elements of presentation together allows students to harness the greatness inside them. This process can create an innovative and holistic literacy lab in the classroom that allows students to explore, expand, and exercise their artistic muscles while giving them powerful tools to write, read, memorize, and recite their work. The repetition of these efforts helps lessen fear of judgment and feelings of awkwardness and creates a vibrant community of poetry giants in your school. Just think, from elementary to secondary classrooms, students will take these rich experiences with them into their homes, schools, future colleges, universities, careers, and the world. From the swirling stories pouring out of the minds and hearts of our students into the world they will reimagine will come a new kind of engaged writer. One of my greatest joys is guiding a student through the process of writing that first word to speaking it with confidence, passion, and conviction. All of us desire to have moments that connect and resonate positively throughout our lives. These memories can influence and inspire life choices, our attitudes toward language and the arts, and most importantly, become demonstrations to ourselves about what is possible. Presenting empowers young people. Just think of the reception your students will receive when they share their work. Witness the tremendous confidence they will gain in releasing their original work in the world through spoken word and presentation.